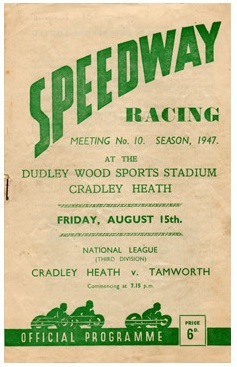 Cradley Heath has witnessed speedway racing since 1947. The initial meeting was held at the Dudley Wood Sports Stadium on 21st June 1947 when they defeated Wombwell by 46-36 in what was a Division 3 match. 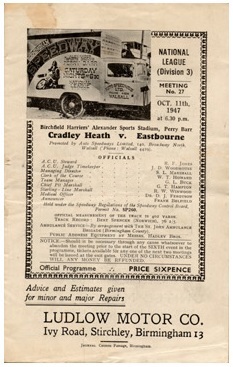 Two years later Cradley were promoted to the Second Division, and were members of Division One from 1968-74 and again in 1991-94. In their final year they were members of the Premier League, with their final match taking place on 28th October 1995 when they enjoyed a hard fought draw. The team enjoyed success in the league in 1981 and 1983; won the Knockout Cup on 10 occasions firstly in 1961 and finally in 1989, and were also Premiership winners on 6 occasions in the period 1982-90. Greyhound racing first took place at the Staffordshire track in 1966 and crowds reached a peak in the early 1980's. The most prestigious races that were held at the track were the Golden Hammer (over 500 yards) and the Elsinore Stakes (over 462 yards). The team were known as the Heathens throughout the period 1947 and 1995, except for the 4 year period from 1973-6 when they were 'United'. The Cradley Heath Heathens currently (2019) contest the National League. Recent successes include the National Shield in 2011, 2012, 2013 and 2014, and the National League Knock-Out Cup in 2013 and 2014.